Our historical tour of Miami immerses you in Miami's rich history, architecture, and diverse cultures. Your guide will take you on a journey through Miami's historical neighborhoods and to its iconic architectural landmarks. Our guides are passionate about Miami's history and architecture and they are full of fascinating stories you will enjoy hearing. Come with us on an entertaining journey through time full of beauty and grandeur. This private tour begins by taking you back thousands of years at the resting place of Miami's earliest known inhabitants at The Miami Circle. We then explore Miami’s latest architectural marvels in our bustling financial district. After passing underneath towering glass and concrete high-rises, we enter a world of natural beauty and charm in Miami’s most historical neighborhood: Coconut Grove. Amidst its dense forest hides a true gem, the early 20th century estate Vizcaya. 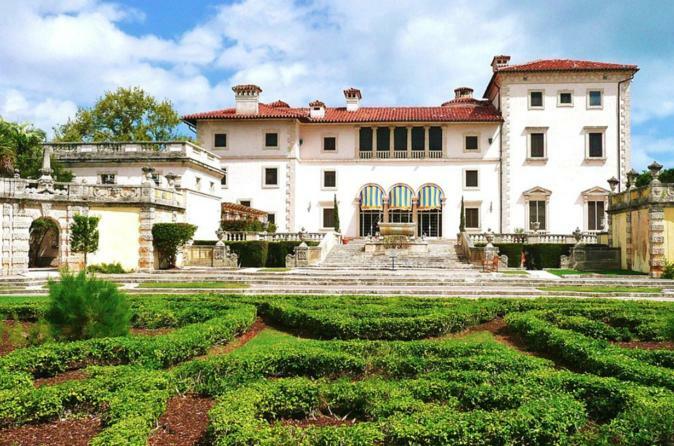 Vizcaya is filled with European charm and early American innovation and is truly beautiful. After Viscaya, we dive into Miami’s Cuban Heritage. We visit the National Shrine of Our Lady Of Charity on the waters of Biscayne Bay to discuss how religion and architecture solidified and grounded Miami’s Cuban American community. We then make stops in Coconut Grove at the remarkable Plymouth Congregational Church and in Coral Gables at the famous Biltmore Hotel. Our last destination is in South Beach. We explore representative pieces in the Art Deco district while discussing how this uniquely 20th century style evolved into different sub styles in Miami Beach. If you are interested in history or architecture, you should take this tour.